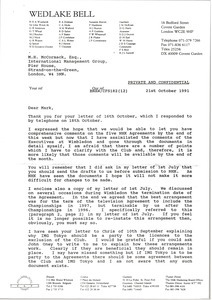 London (England) - Weatherill writes regarding Japan Broadcasting Corporation's contract with Wimbledon and sends his letter written to McCormack from July 1, 1991. 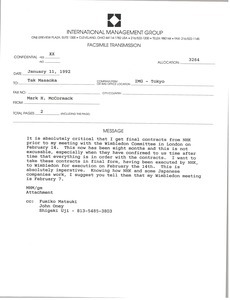 McCormack writes regarding the Japan Broadcasting Corporation Wimbledon contracts and sends a fax on the topic. 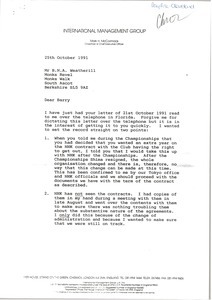 McCormack responds to Weatherill's letter regarding the Japan Broadcasting Corporation contract with Wimbledon.